Paved road all day. Slept in tent. Today we started on the road to Хабаровск. This was still a good quality paved road. We had some gradual climbs as well. Yesterday we stocked up on extra food since we weren’t certain when we could find cafes or stores. Bert was up early to fetch his bicycle from the baggage train. We packed our bikes and gear. It all took some time, so it was 9am before we left. There was a disturbing scene as we left town: a young girl lying on edge of the road, a mother screaming hysterically, a man stopped with his car phoning on the cell phone, several other motorists stopping as well. It must have just happened. We cycled slowly up to the top of the hill. 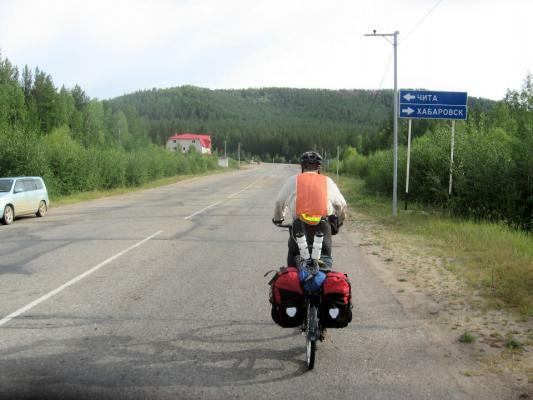 We then descended through Песчанка and then a left turn at 9km. This road was already marked for Хабаровск. We rode this road for another 8km to reach the “M58” road. Here was our first stop at a café. We had 2km of descent followed by a 7km climb to the top of the hill. The road bounced around at the top and then we had 11km descent to pass Танха at 41km. 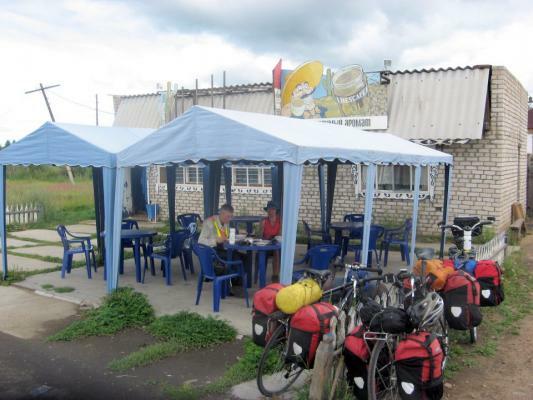 We had our second stop at a cafe at 47km at the turnoff to Новотроицк. We cycled from here over several gradual hills. It was mostly forested areas with just a few houses. I enjoyed this as nice forest riding. By 80km it was getting late, so we started looking for camp sites. We tried once or twice, but then found a nice stop along a stream. This is the first time we fetched water from a stream rather than getting it at a village or store/cafe. Nice to be on the road again with three of us. Also nice to start with pavement before the gravel roads ahead.